A thrilling performance of Luonnotar in which Isokoski's sonorous soprano is matched by atmospheric playing from the Finnish orchestra. The rest of the disc makes you wonder why Sibelius's orchestral songs occupy one of the most unjustly neglected corners of his output. The new reference in this repertoire of orchestral songs by Jean Sibelius is Soile Isokoski! Isokoski interprets these inspired miniatures with a blend of tenderness and passion, a richness of timbre and subtle dynamic inflections, with soaring lines magically floated and tailored. Sibelius's orchestral accompaniments, so deft in defining different moods, are a bonus in Leif Segerstam's assured handling. Newcomers to Sibelius's songs could find no more persuasive introduction; aficionados will be entranced. Un CD à mettre entre toutes les oreilles, et au plus vite, grâce à ses grandes qualités musicales et surtout, des belles découvertes qu'il permet. Isokoski's burnished soprano reaches ecstatic heights here, in a performance that you could measure against any in the catalogue, while Segerstam and the Helsinki Philharmonic become a wave machine, generating the ocean's pulse and the play of light on water. (...) this is really an exceptional, often magical recital. Try it; I think you'll bewitched. F eaturing this dream duo (Soile Isokoski and Leif Segerstam) and the fabulous Helsinki Philharmonic Orchestra, here is a stunning disc, which undoubtedly ranks among the best and most interesting recordings of this year. (...) To own this CD is a must!!! 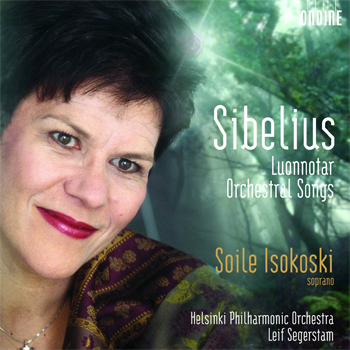 Soile Isokoski's voice has matured into a powerful instrument without losing its distinctively plangent expressiveness and intense way with words - both in Finnish and Sibelius's favoured poetic language Swedish. Segerstam (...) here provides spacious yet vividly dramatic support, with superb orchestral playing. And the recording, excellent in CD stereo, is utterly stunning in multichannel SACD: airy, large-scale, immediate and detailed with diamond clarity. (...) this whole disc's a Sibelian essential. Soile Isokoski has never made a more beautiful recording than this. She offers what must be accounted, hands down, as the finest performance of the tone poem Luonnotar currently available. (…) A marvelous release in every respect. A magic Luonnotar, layed on an orchestral tissue and performed by Soile Isokoski in one of her most beautiful recordings (if not her most beautiful one). (…) the chemistry between Isokoski and Segerstam is perfect. (…) This anthology has no competition in the catalogue. Soile Isokoski (…) has arguably the most beautiful voice of her type, excelling in Mozart and Strauss. Here, she sets down her equally glowing credentials as a Sibelian. Soprano Soile Isokoski overwhelms not only because of the mere beauty of the songs, but she also delivers moments of consummate artistry. This hybrid SACD features the Finnish star soprano Soile Isokoski with her first all-Sibelius recording of works for voice and orchestra, including the tone poem Luonnotar and eighteen of Sibelius's orchestral songs. Luonnotar (Daughter of Nature), completed in 1913, is a powerful tone poem for soprano and orchestra. Based on an excerpt from the Finnish national epic Kalevala, the song tells of the mythical creation of the earth and the sky. Performed in their original language (Swedish, Finnish), this recording contains almost all the songs of Sibelius that were orchestrated by the composer himself (the only missing song being out of Ms. Isokoski's vocal range). Almost all the other songs featured on this recording were orchestrated by Jussi Jalas, Sibelius's son-in-law, (tracks 1, 7, 10, 14-16, 18) or by his close contemporaries Ernest Pingoud (3), Ivar Hellman (4) and Nils-Eric Fougstedt (8).